Under new leadership, having been acquired in December 2018 by locomotive owner David Buck, The Steam Dreams Rail Co are delighted to be celebrating their 20th anniversary this year. 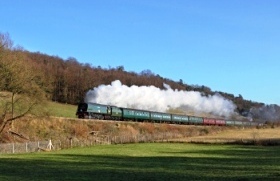 Since its inception in 1999, Steam Dreams Rail Co has gone from strength to strength and now welcomes over 19,000 passengers on board each year on over 50 trips and stop at 100 stations across the UK. In addition to our extremely popular day trips Steam Dreams also offers a number of UK Holidays by Steam including The Highlands and Islands with Flying Scotsman and the Emerald Isle Craic Express. In 2019 we will be launching two new services, The Royal Windsor Steam Express and The Sunset Steam Express.